Essential oils have been used for thousands of years for cosmetic, spiritual, and medicinal purposes. We offer only Young Living Essential Oils, the best on the market. If you have any questions, or would like to receive discount pricing or make money selling oils, please contact us for information and support. Sign Up & Get 24% Off! What can Peppermint do for you? After a workout, put 1 to 2 drops directly on the sore parts of your body. You can also cut the oil with a carrier oil if you have more sensitive skin. Peppermint can be applied to your scalp or included in your favorite shampoo to promote healthy hair and stimulate hair growth. Add a drop of Peppermint oil to 8 ounces of water to support a healthy digestive system. You can also apply the oil to your feet or stomach to aid in digestive functions. Rub a drop on your temples, forehead, and the back of your neck to relieve head pressure and tension. Rub the oil under your nose or apply it to the back of your neck and shoulders throughout the day to keep your energy levels up and improve alertness. Do you have any additional uses for Peppermint oil? Share them in the comments! 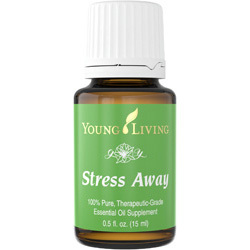 Stress Away is a blend of Copaiba, Lavender, Cedarwood, Ocotea, and Lime essential oils and offers a natural solution to combat everyday stresses. The combination of Lime and Vanilla relieves stress, while the Copaiba and Lavender reduce mental rigidity and restore your equilibrium. Stress Away can help induce relaxation and occasional nervous tension. What essential oils are in Stress Away? A rare oil that supports the body's natural responses to injury and irritation, and supports healthy digestion. Helps you relax, de-stress, and wind down before bed. The earthy aroma provides a sense of security, and is calming, purifying, and grounding. Helps aid the body's natural responses to irritation and injury. It has natural cleansing and purifying properties. Lime is best known for boosting immune system functions. It can be ingested for antioxidant support and weight management, or applied to the skin to support healthy skin. Is soothing and comforting, has calming properties, and eases stress and irritation. Stress Away comes in both the essential oil form and in a convenient roll-on bottle. Lemongrass (Cymbopogon flexuosus) oil supports your overall well-being, and may support the digestive system. Adding Lemongrass oil when you are cooking is also a delightful way to enhance the flavor of a meal. What can Lemongrass do for you? Lemongrass is an analgesic and can help reduce pain and inflammation. Just blend it with a carrier oil and rub in over the area. Lemongrass oil can kill bacterial and fungal infections, such a ringworm and athlete's foot. Dilute with a carrier oil and rub into the infected area. When diluted and ingested, Lemongrass can boost the functioning of the digestive system. It can treat bowel problems and prevent the formation of excessive gas. Lemongrass oil can help strengthen hair follicles, helping with hair loss, oily hair, or scalp conditions. Just put a diluted solution along your scalp, then rinse. Put Lemongrass oil in a diffuser or puts a few drops in some water and use it as a mist to freshen the air in your home. The hight content of citral and geraniol in Lemongrass oil repels bugs such as mosquitoes and ants. You can even use it on pets to kill fleas. Just dilute about 5 drops in a spray bottle of water and spray directly on your skin or a pet's fur. Do you have any additional uses for Lemongrass oil? Share them in the comments! Frankincense (Boswellia carterii) has been sought after since ancient times. The complex aroma of this oil can elevate many aspects of your life. Frankincense essential oil has an earthy, uplifting aroma that’s perfect for grounding and spiritual connectedness. Create a safe and comforting environment when you diffuse or inhale this empowering oil. What can Frankincense Oil do for you? Place frankincense on a scar to reduce its appearance. Massage a few drops into the bottom of your feet or diffuse a few drops throughout your home to boost your immune system. This works best in your bedroom at night, and is especially useful during cold and flu season. Apply to your temples to relieve stress and evoke calm feelings. Dilute a few drops into a carrier oil and rub onto the back of your neck for relief from anxiety. Dilute frankincense oil 50/50 with a carrier oil or add a few drops to your favorite moisturizer to reduce fine lines and lessen the appearance of wrinkles. Apply a single drop 3 to 4 times daily mixed with a carrier oil or lotion until the spot is gone. If you have a mole that changes shape or grows, be sure to consult your healthcare professional for possible treatment. Frankincense is a powerful anti-inflammatory and can be used with a carrier oil where pain and inflammation are present. Diffuse this oil to open the senses and establish a calming atmosphere. Perfect for meditation, de-stressing, and promotion of sleep. Frankincense oil can be mixed with baking soda and coconut oil to create a natural toothpaste. The oil can prevent tooth decay, bad breath, cavities, or oral infections due to its antiseptic properties. Frankincense is an antiseptic, which means it helps to eliminate bacteria and viruses from your home. Diffuse the oil to help reduce indoor pollution, add it to water to deodorize and disinfect any room or surface in your home. If you have gas, stomach aches, constipation, cramps, or even PMS, you can use 1 to 2 drops of (100% pure) Frankincense oil in 8 ounces of water or a tablespoon of honey for natural GI relief. Frankincense essential oil is considered a holy oil in the Middle East, where it has been used in religious ceremonies for thousands of years, and was one of the gifts given to Christ at his birth. Frankincense is mentioned in one of the oldest-known scientific records, the Ebers Papyrus, dating from the sixteenth century B.C. Frankincense is the resin tapped from the bark of the Boswellia carterii tree. Young Living has partnered with a supplier in northern Africa, near the Arabian Peninsula, as its primary source for frankincense. Do you have any additional uses for Frankincense oil? Share them in the comments! Thieves essential oil blend is inspired by the legend of four 15th-century thieves in France that formulated a special aromatic combination of clove, rosemary, and other botanicals to protect their health while robbing the dead and dying. When taken internally, Thieves can support healthy immune function, and includes eucalyptus radiata essential oil, which may help maintain a healthy respiratory system. What can Thieves do for you? Rub it on your feet to give your immune system a boost, especially after you have been exposed to an illness. Blend aloe vera gel with a few drops of Thieves to create a hand sanitizer sans any harsh chemicals. 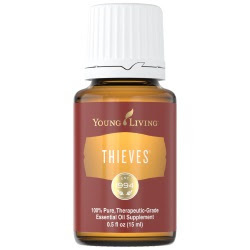 Mix Thieves with your favorite carrier oil and rub the blend on your chest to alleviate coughs or clear your airways. A warm compress combined with this mixture helps amplify the effect. Use the blend in a home diffuser to refresh the air in your room and gain the health benefits of the oil. That's right, you can mix one drop with eight ounces of water and a pinch of salt to create a gargle that supports respiratory and immune health. Do you have any additional uses for Thieves oil? Share them in the comments! How concentrated are Essential Oils? How concentrated are the Essential Oils by Young Living? Short answer: Very potent! It takes about 75 lemons to make one 15 ml bottle of lemon oil. It takes about 27 square feet of lavender plans to make a 15 ml bottle of lavender oil. And, it takes a pound of raw peppermint material to make one 15 ml bottle of peppermint oil. Let's break these numbers down a bit further, shall we? A 15ml bottle of lemon oil takes 75 lemons. With about 300 drops in a 15ml bottle, 1 drop of lemon oil is equal to about 1/4 a lemon. A 15ml bottle of lavender requires 27 square feet of lavender plants. There are 300 drops in a 15ml bottle, so 1 drop of lavender oil is equal to .09 square feet of plant material. A 15ml bottle of peppermint oil takes about 1 pound or 453 grams of peppermint plant material. With 300 drops in a 15ml bottle, 1 drop of peppermint oil is equal to 0.05 ounces or 1.5 grams of peppermint plant. That means 1 drop of peppermint oil is equal to about 28 cups of peppermint tea. Now, that is some potent stuff! Are you interested in learning more? Are you interested in learning more about essential oil use for health and wellness? There are a few things you will need to know before getting started on your journey. Through the online store at retail prices via this link. If you have questions about getting started with essential oils, you can ask us questions via Facebook, Twitter, or this contact form. As a beginner, you probably have many questions you'd like answered to prior to ordering your first oils. Why should I become a Young Living Wholesale Member? 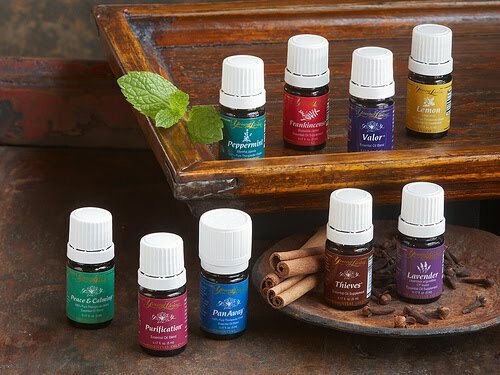 Wholesale Members are Independent Distributors that receive wholesale pricing (24% off retail) and have the option of sharing oils with friends and family to ean comissions and participate in promotions for free items. If you are interested in becoming an Independent Distributor, please contact us and we would happily assist you in getting started. Just be sure to sign up here to get your Premium Starter Kit! 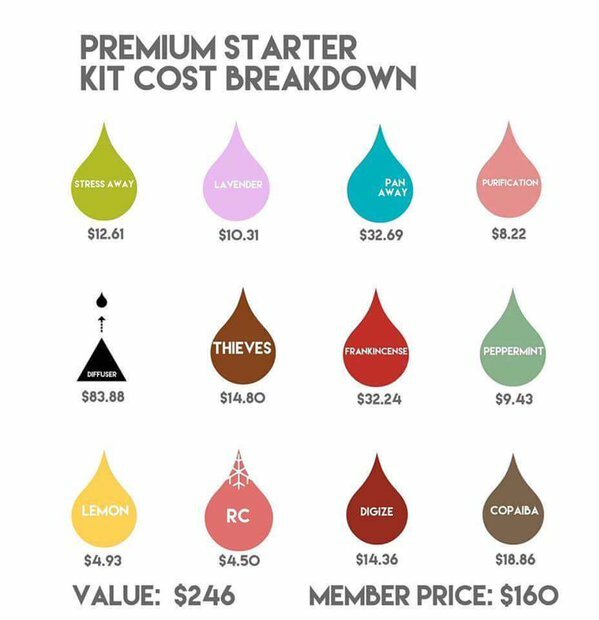 In order to become a Wholesale Member (and receive 24% off retail prices), you must order a starter kit from Young Living. If you do not wish to invest much to get started, feel free to get the Basic Starter Kit for $45. 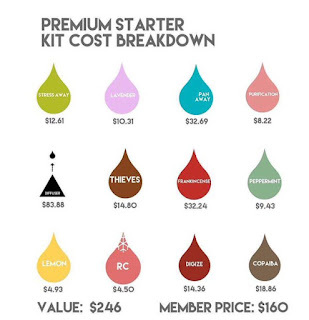 However, your best value for money is the Premium Starter Kit. All of this is valued at over $300, but costs you only $160 as a Wholesale Member (and don't forget about 24% off all future purchases)! That is all! 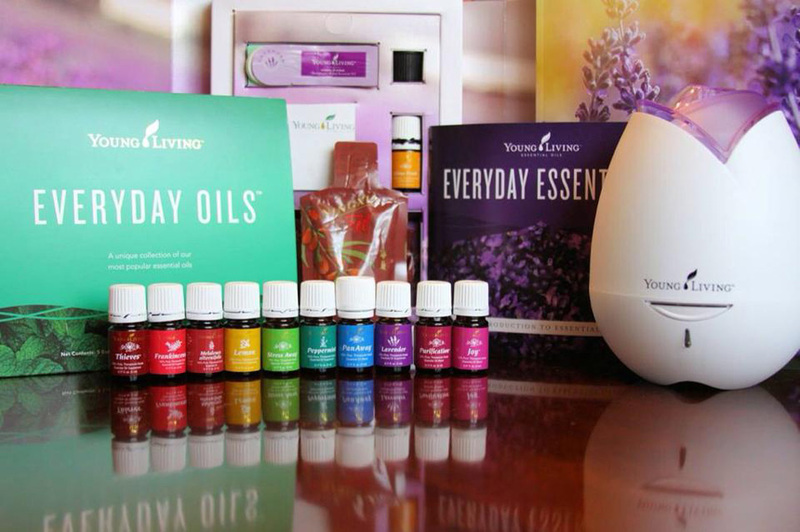 Congratulations of beginning your journey into the amazing world of Young Living Essential Oils! If you have any questions, need support, or just want to connect, please reach out via the comments, Facebook, Twitter, or the contact form. And don't forget to sign up ASAP! *Statements in this blog have not been evaluated by the FDA.. Ethereal theme. Powered by Blogger.